The Institute of Contemporary Development has published its monthly analytical bulletin for February. The main topics of this issue are: Russia’s foreign policy strategy and domestic development; the future of resource economies; US foreign policy; Great Britain and EU; and, the expert community and global processes. 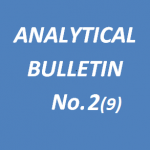 The annotation of Analytical Bulletin No.2 (9) can be found below. The full text of the bulletin in Russian can be found here. Igor Yurgens. Is Great Britain Leaving the European Union?